Inserts are the absorbent core of the washable nappy. They are responsible for absorbing as much of the urine as possible before changing. They also make pretty handy wipes on the compactum and in the nappy bag. There are two types of liners available. These are available in a roll containing 100 perforated sheets of bamboo viscose. They are easy to use and handy to have. Our disposable liners are biodegradable and compostable. Wet only liners can be added to a compost heap and your paper recycling. With regards to flushing we advise caution. Liners are not the same as toilet paper, they breakdown slower and can cause issues with your sewerage system. It is vitally important that you know your toilet system before you choose to flush liners. Our fleece liners are made from coral fleece. This quality polyester synthetic fabric is the perfect stay dry fabric for a nappy liner. As it is a non-absorbent fabric these liners are super-fast drying and easy to clean. Even the messiest changes can be cleaned with the power of a toilet flush and a firm grip on the end of the liner. If baby is particularly sensitive to wet then these are a great option. Fleece liners are also a great way to save money. Fabric softener is designed to “soften” fabrics. This is achieved by coating the fibre with lanolin or a similar compound. Unfortunately, if you coat the natural fibres of your cloth nappies they will lose their absorbing quality. Nappies that have been washed with a softener will most likely return to normal after being stripped in a normal wash cycle without detergent. Can I use bum cream? We do not recommend the use of commercial bum creams as they contain petroleum and zinc. These will ultimately damage the natural fibres and clog your nappies. You can use these creams with liners however we recommend caution as the damage can be irreparable in extreme cases. Generally speaking bum cream is not necessary with cloth nappies however if you feel that you need to use one then try find a product that is local and organic like our handmade bum balm. Can I use baby powder? As with bum cream the problem with most commercial baby powders us that they will clog up your nappy. If you feel that baby powder is something that you need to use they remember to source a product that is local and organic as well as ensure the use of liners. What is Hard Water? Hard water is caused by compounds of calcium and magnesium. The greater the concentration of these minerals, the harder the water. Why is it a problem? When detergent is added to hard water it combines with the calcium and magnesium rather than the fabric. This means it is rinsed away without cleaning the nappy while the minerals in the water clog the fabric trapping the dirt and ammonia. If possible, wash on a warm setting. This will help the powder detergent dissolve and increase its cleaning ability. Most powder detergents have built in water softeners. If you can only use cold water, use a liquid detergent as they will dissolve easier in the hard water. Increase the recommended dosage by about 30% to improve cleaning results. Do not add vinegar or an extra rinse cycle. Stick to natural fibres as synthetic fibres will be more prone to hold smells. Fabric softeners will not “soften” water! They are designed to condition fabrics and will not improve your hard water washing. Borax and Washing Soda will damage your nappies over time. It is important to note that most modern laundry detergent will combat hard water so it is worth doing some research and finding one that works best for you and your wash routine rather than trying possibly damaging solutions. Cloth nappies are mistakenly perceived as wet, unhygienic and leaky overnight. The great news is that fabric technology has evolved and all modern cloth nappies can now have a stay dry fleece liner that keeps baby’s bum dry. Regarding nappy rash, if baby is dry and in a chemical free fabric then rashes will be greatly diminished. You will still need to ensure baby is changed often enough and nappies are thoroughly washed. Sleeve – “All in Two” – a nappy which resembles an All-In-One, except the absorbency can be detached for easier and faster drying. One-size-fits-all (OSFA) Nappies have 4 rows of clips on the front of the nappy called Rise Snaps. These four rows of rise snaps give you 4 sizes, small, medium, large and extra-large. Close the rise snaps in the front of the nappy to where you think it will fit your child, small babies will have all the rise snaps closed. OSFA nappies generally fit babies between 5 – 17kgs. Once the nappy is on the child check to see it is the correct setting and change if necessary. Make sure the nappy is firm (but not tight) around the legs. The nappy may fit around the waist, but you may get gaping around the legs, this can be an indication your baby is still a little small for the current size setting. Check every few months to see if the nappy is still on the correct setting and adjust accordingly. Cloth Nappies do not contain the chemicals and perfumes that disposable nappies do. Natural fibres such as cotton and bamboo allow your babys skin to breathe. Nappy rash can be reduced greatly by using cloth nappies as they allow the skin to breathe and therefore helping reduce nappy rash. With disposable nappies, it is often hard to tell how wet the nappy is, often resulting in the nappy being left on the baby for long periods of time, thus resulting in nappy rash. 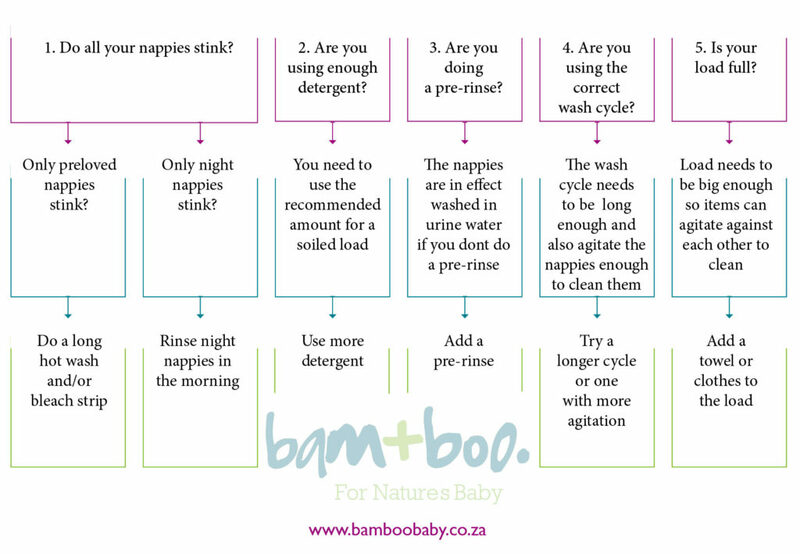 When using cloth nappies you need to ensure baby is changed often enough and the nappies are washed thoroughly. Have you ever noticed how the very clever marketing departments for the disposable nappy companies like to compare the feel of their products to cotton? Maybe because cotton is the softest most comfortable thing you can put on your baby’s bottom? Their skin is very thin and sensitive and that super absorbent gel they use in disposables, whilst very efficient at pulling away the urine, also pulls away the skin protecting moisture along with it. Don’t be fooled, just because the baby feels dry does not mean they are clean and those disposable scented, soapy wipes they are selling you are only going to dry out your baby’s bottom more and leave them more likely to develop a painful diaper rash. If you decide to go the disposable route you are likely to spend somewhere around R20000 on disposable nappies and another R4000 on disposable wipes. Our cloth diapering system will save you approximately R15000 on nappies and will save you an additional R3500 on disposable wipes. Maybe using cloth isn’t as easy as throwing away disposables but they are not that much more work. You will never have to run to the store in the middle of the night because you ran out of diapers and you will have a lot less trash to take out as those used disposables pile up quicker than you think. You won’t have to bring home a huge pack of nappies with your groceries all the time. Cloth is a lot easier today than it was in your grandmother or great grandmother’s day. Our grandmothers would have considered shaped diapers with no need for pins a breeze. Not to mention we have washing machines, which make it so much easier than having to wash them by hand as they used to. These figures were based on 2017 figures. Today only about 4% of children are trained by age two and approximately 12% are still in diapers between three and a half to four years. The billion dollar multinational disposable diaper corporations have done a very good job of making their diapers so absorbent that children don’t even know when they urinate and make them so dry and cushy when full of urine that there isn’t much reason for the child to want out of those nappies. They have also done a very good job at making the parents believe potty training at a younger age is not possible and now there is the launch of a size six diaper plan to keep your kids wearing their diapers even longer. In 1957 92% of children were potty trained by 18 months of age. When assessing the environmental impact of cloth versus disposable nappies, it is important to look at the whole life cycle of the nappy. This includes raw materials, manufacturing, transportation and waste effects. Studies have reported it takes as much energy to product one disposable as it does to wash a cloth nappy 200 times. Every day millions of disposable diapers are discarded. Each baby diapered in disposables will contribute approximately 2 tones to our landfills. It is unknown how long they will take to decompose but is estimated to be between 250 – 500 years. Cloth Nappies don’t contain any harsh chemicals unlike disposable nappies. Lots of babies have allergies towards the chemicals in disposables which leads to nappy rashes. Doctors often prescribe cortisone and other harsh creams for these rashes leading to further problems. To get an idea of how many nappies you may need, consider how many times a day do you change your baby’s nappy, and how often you want to wash? To give you an idea, it is recommended that a Newborn needs changing every 2 to 3 hours, that’s between 10-12 times a day. An older baby will need changing up to 6 times a day. You will need to wash the nappies every 2 to 3 days. Based on this, you may need around 24 nappies for a Newborn and 18 to 20 nappies for infants and toddlers. For this very reason we offer discounted packs of 10s and 20s in our Bulk Pack section. When you first bring your order home, pre-wash the nappies before use. Please remember that inserts that contain Bamboo only reach full absorbency after about 8-10 washes but may be worn after the first wash. Before they have been washed 8-10 times, they may not hold as much liquid so be patient. Un-snap all the inserts from the shell before placing in an empty dry bucket. Do not soak as this will damage the Bamboo fibre. The nappies can be kept in a dry bucket for up to 3 days. Any longer and the ammonia in urine will destroy the Bamboo fibre resulting in holes. Place a full load of nappies in the washing machine, set your machine on the longest cycle and add any detergent. Never use softener and watch out for detergent with ‘built in’ softener. If you do use softener on your nappies this will result in poor absorbency. If you don’t have a full load of nappies to wash, add a towel to increase agitation. Preferably dry on the line but if tumble drying is necessary, only tumble the inserts on low heat. You cannot tumble dry the waterproof shell, this will result in delamination. A green bar of Sunlight Soap is one of the most affordable and effective stain removers. Scrubbing nappy lightly before putting it into the washing works wonders. To avoid staining and build up on the nappy it is best to use a nappy liner and to try avoid zinc based creams as these contain metals and will cause the inside of the nappy to blacken. Sunlight is also great for removing stains so dry your nappies outside on the line as often as possible. Please do not use bleach or other harsh detergents as these will damage your nappies. Always use Cloth Safe bum cream. Make sure to use a liner if you do have to use bum cream.